Approximate shipping weight: 564 lb. I have been using this jointer for almost three months. It has exceeded every expectation! It is amazingly good at smoothing boerds, leaving a glasslike surface. Out of the box the bed was dialed in perfectly. Top quality in every regard. Very happy with this 8" jointer. Took a bit of fiddling to get the tables coplanar. Also purchased the igaging 36" straight edge to assist in that process. Kept chasing a tight tolerance but could not get there. Finally figured out the straight edge was not up to the task. Bought the Veritas 36" one and it is so much better. Got the beds set to within .002" in just a few minutes. 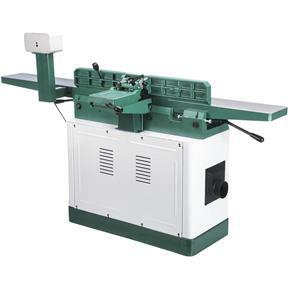 The jointer runs smoothly and quietly. Needed to re tighten the drive belt after a few days but that is normal stretching on a new machine. Parallelogram beds are the way to go!!! And the spiral cutter head is really nice. Machine runs smoothly and quietly while making a clean cut in curly grained maple. I went back and forth for months about whether or not to buy a spiral cutterhead jointer. I'm so glad I made the decision to buy it, and this one has been a good choice. Everything went together well in the assembly process, and it is as sturdy a machine as it should be for this purpose. Tables are flat and easy to adjust, and everything was already parallel at assembly. The motor has plenty of power (probably more than I really need! ), and I did not even need to adjust the pulley alignment after installing the motor. The dust collection works very well as long as the DC is sized correctly. I tried it at first with my small wall-mount DC and it couldn't keep up. With it hooked up to my Grizzly 1 1/2 hp DC, though, I have no problem with dust or chips gathering at the cutterhead. The only things I wish were different are the switch (I would prefer the type of magnetic switch found on most table saws) and the front caster (as others have noted, it comes down really hard, and mine will not swivel as the wheel itself catches on the housing). The caster problem is something I need to take up with customer service, but I have not had the time. 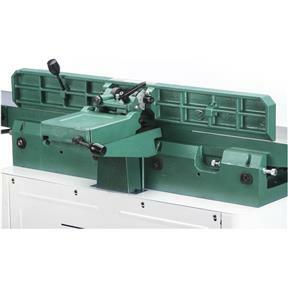 Even so, if I needed to buy another 8" Spiral Cutterhead Jointer, I would buy this model again. The jointer functions well. There was a bit of an issue during assembly. The fence was misaligned and the tech support folks were unfamiliar with the issue and the fix. Upon further investigation, I discovered the mount may not have been properly aligned. I adjusted the three screws holding the mount and was able to align the fence. I replaced a 6" Grizzly jointer with the G0490XW (by the way sold my 6" jointer in 1 day for nearly the price I paid for it after using it for 2 years). This is a great piece of machinery. The tables and fence are flat and well finished. I had no adjustments out of the box other than setting the in-feed table for cutting depth. Assembly was easy and straight forward. I had help lifting the jointer bed onto the stand but beyond that 1 person can handle it and I'm 60 years old. I did have an issue with the fence maintaining square with the table and ended up having a problem with a part that clamps the fence in place. This was my first interaction with Grizzly customer service and it was also an excellent experience. Replacement parts were shipped within days with no hassle what so ever. 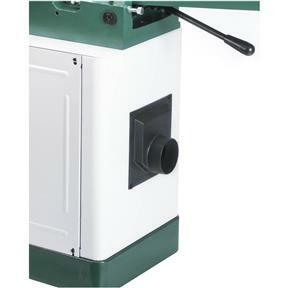 If you are hesitant because of the low price of this machine like I was - don't be. It saved me hundreds of dollars and it performs beautifully. It's powerful, quiet and produces smooth flat stock. I've not experienced any tear out which is a constant aggravation with knife cutters. I highly recommend this machine. 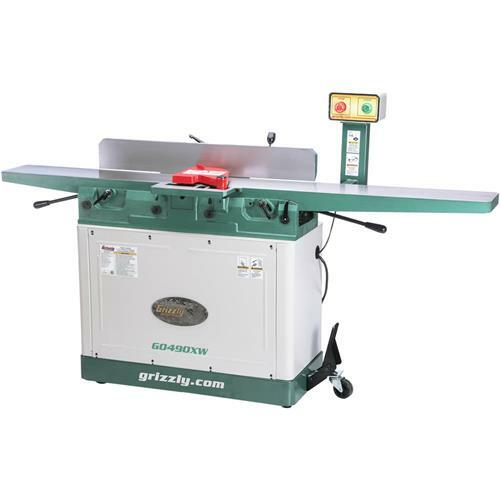 As i was shopping for jointers, a question lingered in my mind, "whats the difference-other than paint color, between this jointer for $1350, and one costing $3000?" Well, as if i wasn't confused before, i certainly am now! I am really impressed with this machine. I really can't imagine getting anything more out of this, it leaves little/nothing to be desired! How other companies are selling 8in jointers for $3000+ i'll never understand. The ONLY "knock" that i can give it is in the fence. I'm not crazy about the 45 and 135 degree adjustments. You kind of have to lift the fence off the table and adjust it. its not very controlled or "fluid". With that being said, in the 10 years of woodworking, i have never used a jointer to create a bevel; so many other tools that are more efficient for that particular operation. I have however, created rabbits on a jointer, and this works great for that tasks. In the end, i really like this product and would not hesitate to recommend it to anyone. I just received my new machine today. Must have had a rough trip, one of the bolts holding the tables to the plywood box were bent. Some other minor damage to the plywood, but the machine was fine. Itâ€™s a beautiful machine. I like the fact that all the fasteners are bolts, not screws or plastic. I like how the switch console was bolted inside the cabinet for safe shipping instead of being packaged in cardboard. The machining on the infeed and outfeed tables is superb, I almost hated to push wood across it. This baby is heavy; I used my tractor to lift it out of the box and onto the cabinet. I choose the spiral cutterhead and it is wonderful, such quality that Iâ€™m amazed that I could afford this machine. I checked every insert, everyone was properly installed and tight. After assembly I checked the tables and they were very close. I adjusted the outfeed table .012 and adjusted the scale on the infeed table. The serpentine belt is quiet. This machine is much quieter than my old 6 inch jointer, and smoother too. I am very pleased with this purchase. Thanks for your RPT. I am planning on buying one of these in the next few weeks. I had an older 8" Jointer from Grizzly before (1985) and I really loved it. Sold my big tools a while back and now rebuilding the shop. On the good side - stuff offered is even better now. I did note that in the eighties people who answered the phone at Grizzly knew more about the product. Did you buy a planner too?